The wear and tear of everyday life can do a number on your feet. In fact, the majority of Americans experience some type of foot pain at one time or another. For most people, the answer is to simply rest your feet and get them ready for the next day. In this post, we will show you 5 ways to fix pain in your feet. While rest might be important, there is more you can do to relieve the common aches and pains you feel in your feet. If something as simple as changing your footwear to a pair of comfortable boots or sneakers doesn’t help, there are many other ways to alleviate your discomfort. The following are a few tips to help you deal with foot pain. A foot massage can be one of the best solutions to relieving pain in your feet. By applying different techniques for massaging your own feet, you can relieve some of the soreness and stiffness that may build up throughout the day. You could consider trying a device like a foot roller for massaging your feet. For a more convenient option, you could simply roll the bottom of your foot on a tennis ball or a golf ball to massage the soles of your feet. Soaking your feet can be one way to relieve pain, but it works even better if you alternate between hot and cold water. All you need to do is get two water basins (or try one of our favourites )and fill one with cold water and the other with water that is comfortably warm. Then just soak your feet in the cold water for about five minutes before switching to the hot bath for another five. After you repeat this process a few times, your feet should feel better. 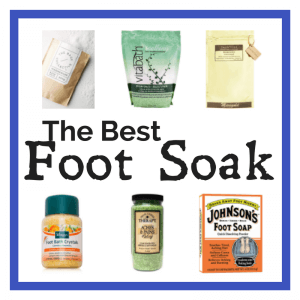 You could even try one of our favourite foot soaks. A light workout can do a lot to relieve foot pain. One option is to place some small objects on the floor and practice picking them up with your toes. Alternatively, you could put a thick rubber band around all of the toes on one foot. With the rubber band in place, exercise your foot by spreading your toes against the resistance of the rubber band. Just stretch the toes out, hold it for a few seconds, and then rest. You need to choose shoes that provide good support at the arches. If you are having trouble finding enough arch support or if you are suffering from pain associated with fallen arches, you might want to consider buying orthotic inserts for your shoes. The inserts can add some extra cushioning to the shoes and provide additional support for people who have fallen arches. If you regularly have pain in your heel, it could be a sign of plantar fasciitis. Plantar fasciitis occurs when there is inflammation to the ligament that runs from the heel to the front of the foot. When a person has plantar fasciitis, one of the best remedies is to perform different stretching exercises on the feet.